REMINDER: REGISTRATION IS CAPPED AT 3,000 ENTRANTS. In Person – at Packet Pick-Up: Fri, 5/10, 4-9 pm & Sat, 5/11, 10 am -6 pm. Not sure if you’ve registered? Confirm your registration here. We’re known for our cute, colorful designs on a women’s-cut shirt. Our tees are an ultra soft poly/cotton blend with minimal shrinkage. Sizes are offered from XS through 4XL, so there’s a fit for everyone. We also offer youth tees in XS and S.
Note: the ladies shirts are running small this year. Our testers say “Size up” to get the best fit. (It’s not you, it’s the manufacturer!) Or, use the ladies size chart to make your selection. Youth shirts remain a standard fit. See youth size chart for details. GROUPS OF 4 OR MORE SAVE $5 PER ENTRY! Make sure you have at least 4 committed participants in your group. Make sure everyone in the group knows the team name prior to registering. When registering, click on the “5K: Member of a team of 4+” option. Complete your registration and checkout as normal. Remind your other team members to register! We want the Mother’s Day 5K to be accessible to all women and girls. We offer a limited number of scholarships for the race entry fee. If the entry fee is a financial difficulty for you or someone you know, please contact our Race Director about our assistance program. 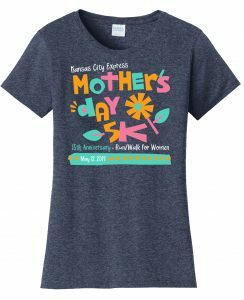 Note: The Mother’s Day 5K takes place rain or shine. The race director reserves the right to cancel or amend the event due to severe weather. As is the case with other running/walking events, refunds are not given for weather cancellations. Registration fees are non-transferable and non-refundable.